Fortnite’s Season 5 is around the corner, and Epic Games have revealed their third and final teaser image on Twitter in preparation. 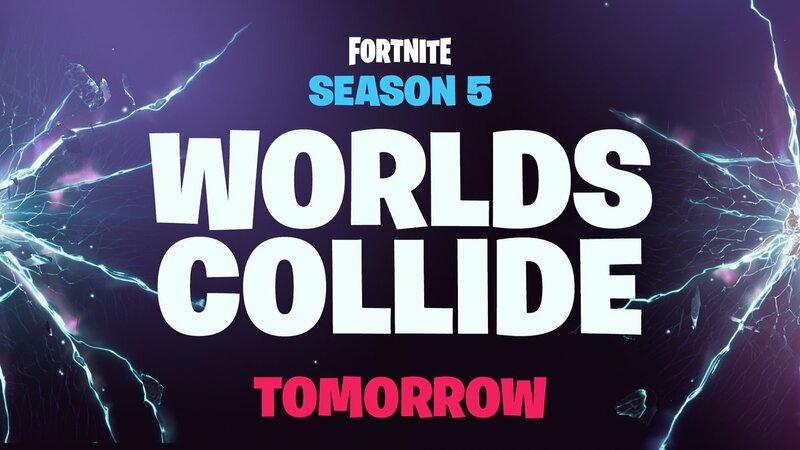 After a Kitsune mask and an axe teased over the last couple of days, the final image claims that tomorrow, “Worlds Collide”. That doesn’t sound concerning at all, right? If you’ve been following all of the brouhaha around Fortnite, it’s been quite the journey. A missile launched in Fortnite: Battle Royale’s map, causing several cracks to appear in the sky. Soon, multiple rifts started to emerge, sucking up various monuments and taking them… somewhere. Monuments like the Durr Burger mascot would then appear in the real world. Loot Llamas in phone booths followed shortly after, appearing in locations like London and Barcelona. Whatever’s going on, whether it’s an interdimensional crossing or time travel, Fortnite Season 5 will go live on July 12th at 1 AM PST. A new Battle Pass will be available with new cosmetics and rewards themed around the season, so get your V-bucks ready. If you’re short, then it’s possible to purchase 1,000 V-bucks for $9.99 with the Season 5 Battle Pass, likely to cost 950 V-bucks.